It is not news that smoking is bad for you. The habit is a leading risk factor for chronic, respiratory and heart diseases, according to the Australian Institute of Health and Welfare. On top of this, it can also negatively affect your teeth and mouth, not only by contributing to bad breath and gum disease, but also by increasing the risk of mouth and throat cancer. Keep reading to learn more about how smoking can affect your oral health, and what you can do to maintain healthy teeth. Periodontal or gum disease is an infection that can cause damage to the bone supporting your teeth. It occurs when bacteria is not removed, and plaque and tartar start to develop. According to the Better Health Channel, heavy smokers are up to five times more likely to suffer from gum disease, which can result in tooth loosening or loss. Most people with oral cancer smoke. In fact, the Better Health Channel states that 75% of oral cancer sufferers are smokers. Typically, oral cancer is most likely to affect the tongue and bottom of the mouth, although it can also occur on the cheeks, palate and lips. Early signs of oral cancer include swelling and persistent ulcers. Even after you’ve quit smoking, the heightened risk of developing cancer continues for about 10 years. 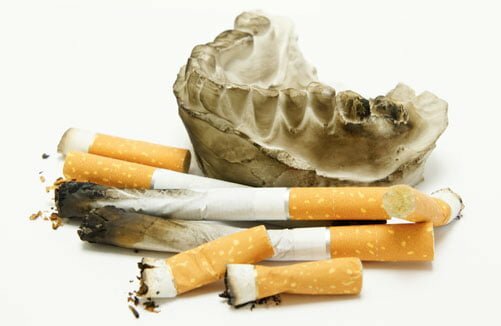 Other examples of medical conditions that can arise as a result of smoking are tooth discoloration, staining, bad breath, and a pale or white palate. Smokers may also not heal as well from tooth extractions and other dental surgery, and may feel greater pain. If you’re a smoker, it’s important to quit smoking, or at least try to cut down and smoke fewer cigarettes each day. There are several programs that can help you with the process of quitting, and you’ll lower your risk of gum disease and oral cancer as well as reap a number of other health benefits if you can. Cleaning your teeth twice a day is advisable. A thorough clean is important, using both mouthwash and floss. Drinking plenty of water and chewing sugar free gum can help you to avoid having a dry mouth, which can contribute to the excessive formation of plaque and tartar. Have oral cancer checks, and regularly visit your dentist for advice on maintaining the health of your teeth. Your dentist can also help identify any issues early, and prevent small problems turning into bigger ones. If you’re located in Sydney and are looking for Ryde dental care, why not come and see us? We can work with you to help improve and maintain your oral health.